Cal Anderson Independence Day Community Picnic with free root beer floats, free hot dogs to the first 500, music performances, pie eating contest and more. Detailed schedule of activities here. Cal Anderson Park, 12 – 5p. Squirt Gun Fight at Cal Anderson Park, 12 – 2p. Fireworks over Lake Union start at 10:15p and Capitol Hill has prime line-of-sight. Here’s our viewing tips. The milieu of the film Berberian Sound Studio is the workplace where horror movie sound effects are created. I’m getting chills already. Premiere’s Friday and continues through July 11th. Northwest Film Forum, 7p and 9p. The Flentrop Concert: Americana Music as performed by assistant organist Alan Du Puy at St. Mark’s Cathedral. An ice cream social on the front lawn follows. St Mark’s (1245 10th Ave E), 7:30p. Mayoral movies series: Seattle Mayor Mike McGinn selected and introduces the film To Kill a Mockingbird. (Gary Cooper. Gregory Peck. Swoon.) Post-viewing enjoy happy hour pricing and free Big Mario’s pizza in the lobby. 8p. Quick Change! is a two-woman burlesque show about life and other hard things. Show repeats on Saturday. Annex Theatre, 7:30p. Music: great summer vibes with Gothic Tropic (from LA), Haunted Horses, and Childbirth. Cairo (507 E Mercer), 8:30p. Spin the Bottle variety show with music, storytelling, sketches and the uncategorize-able. Annex Theatre, 11p. The Totally True and Almost Accurate Adventures of Pinocchio: free and family-friendly performance of this comedy in the Volunteer Park, 2p on both Saturday and Sunday. Mayoral Movies series: Neighborhood activist Kate Martin’s selection is All the President’s Men, the classic journalism movie based on true events. Northwest Film Forum, 8p. Record release party for STONES X FLAME at Vermillion, 9p. RUFF debuts at the Cuff: Vancouver-based party debuts in Seattle. “RUFF is a dance party for MEN who like their MEN RUFF.” Cuff (1533 13th Ave), 9p. Broadway Farmers Market, Pine and Broadway, 11a – 3p. ArtAche Market features vendors and live music at Chop Suey, 1 – 6p. Mayoral Movies series: City Councilman Bruce Harrell selected Papillon, a film based on memoirs of a miserable life and eventual escape from the French penal colony. Northwest Film Forum, 5p. Weird and Awesome with Emmett Montgomery is like “Donny & Marie produced by Andy Warhol at the height of the Factory.” Annex Theatre, 7:30p. 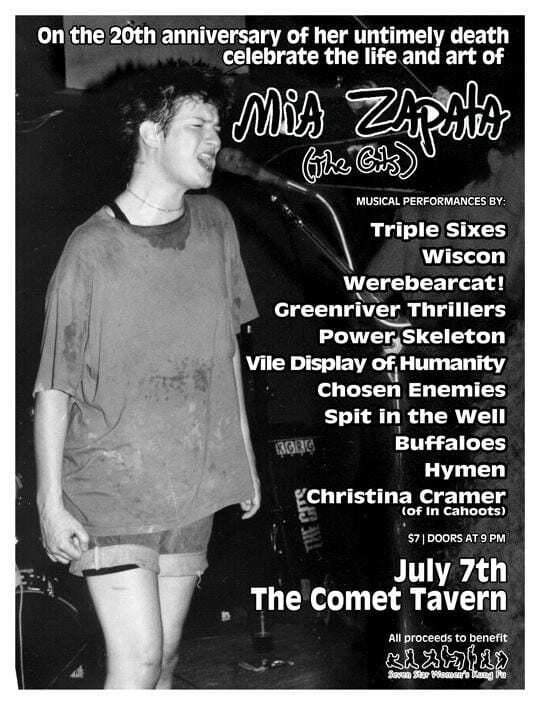 Mia Zapata/The Gits Tribute and Benefit: on the 20th anniversary of Mia Zapata’s untimely death, join local bands covering The Gits music to benefit Seven Star. Yellow roses encouraged. The Comet, 8:30p. ummm, Gary Cooper was in High Noon. Gregory Peck was in To Kill a Mockingbird. Both men would make me swoon.